I’ve talked a bit about the sorts of magic in the Final Fantasy series that are classified by color, and summoning magic as well. What I haven’t really discussed are the other sorts of magic that show up from time to time, particularly in installments that included a job system. The powers involved with these classes can be more interesting than the standard ones, but often somewhat more complicated, and hence not quite as useful as just your standard fire, ice, and lightning. One class that sounds awesome but isn’t so much is the Time Mage, who specializes in spells that speed up allies or slow down enemies. 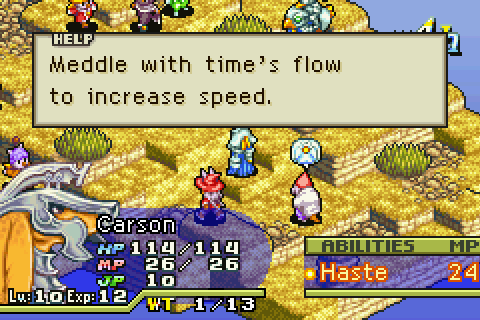 Time magic also includes the ability to produce other status effects, as well as to change gravity and teleport. The Japanese name is apparently closer to “time and space mage,” but that’s a little more difficult to say succinctly in English. 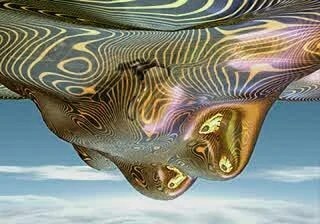 They’re manipulators of reality, like an acid trip. 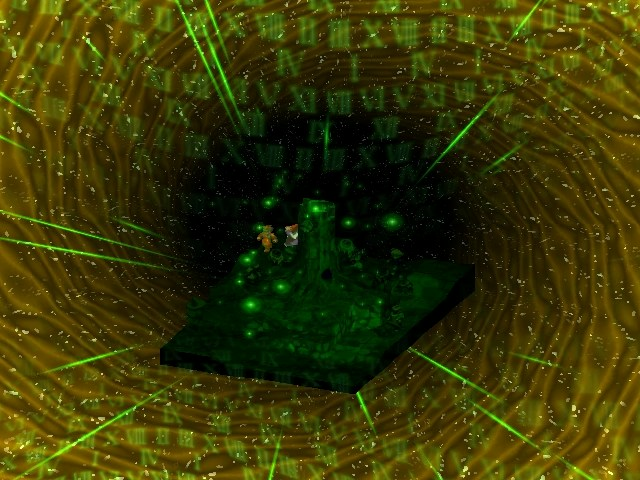 The teleportation spells can transport a party out of a dungeon or a battle, and can sometimes warp away monsters as well. Unlike the Dragon Quest games, the FF ones that I’ve played don’t have a spell for instant transportation to previously visited towns. Well, except for the one occasion in FFIV when Rosa casts Teleport to escape from the crumbling Tower of Zot, and the party ends up in Cecil’s bedroom in Baron Castle. Why can’t she do that any other time in the game? 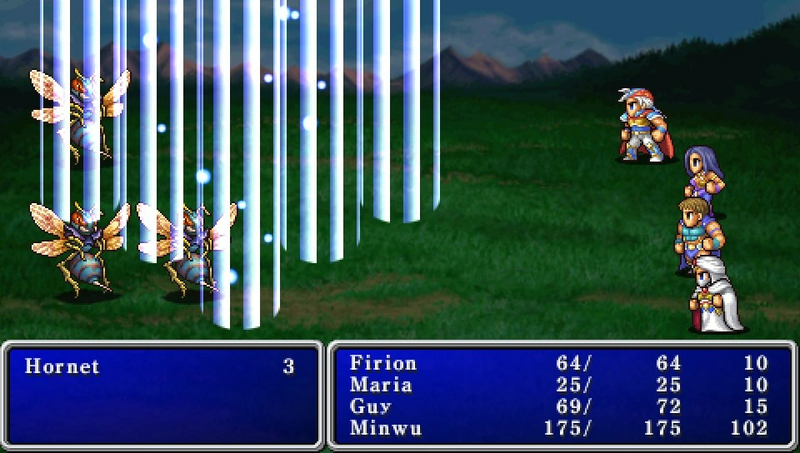 In FFV specifically, there are spells that can cause someone to age prematurely and to restart a battle. I guess that latter is the only way in which time magic can accomplish what it sounds to me like it should, which is time travel. 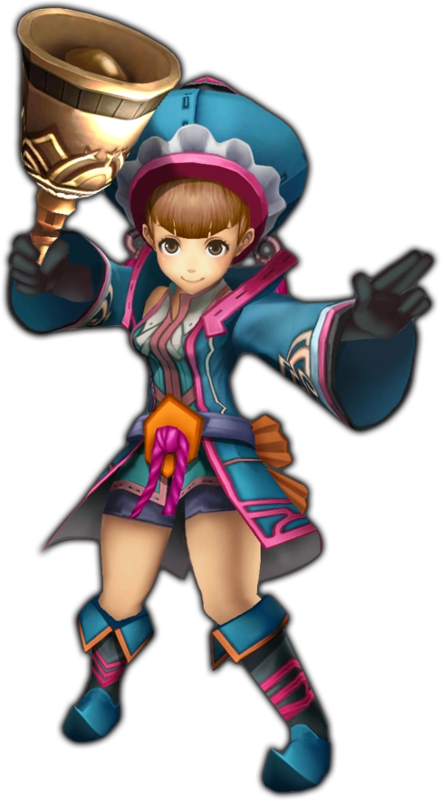 While I haven’t played FFVIII, I know that the main villain Ultimecia uses magic to compress all of time and space into a single point. Based on the description, though, it actually just mixes up different times and places in a sort of psychedelic void. 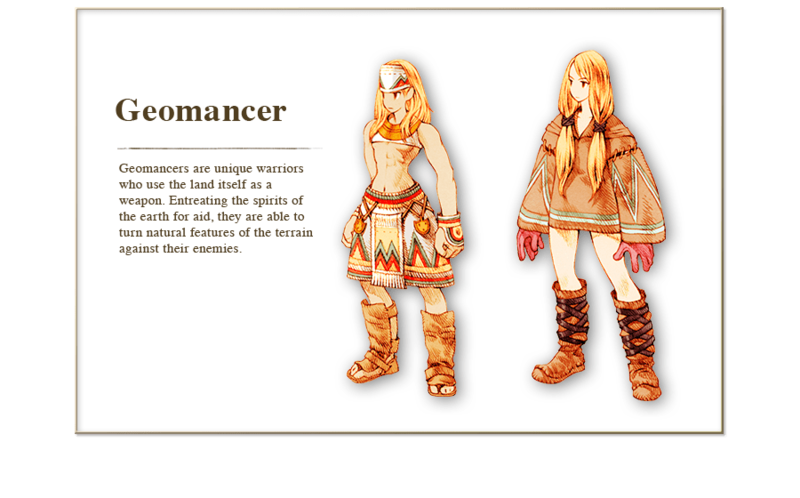 Another interesting class of magician is the geomancer, first appearing in FFIII. They can cause the environment itself to fight monsters, producing earthquakes on land, quicksand in deserts, tornadoes in the sky, rapids on rivers, sinkholes in swamps, and so on. Having a geomancer in the party might be about the only time that the setting really affects a battle. They are also immune to damage caused by walking on magma or other hazardous surfaces, and can avoid traps. Members of this class typically fight with bells, which you wouldn’t think would be too effective unless you’re throwing them at enemies. Then again, if harps can be used as weapons, why not bells? The term “geomancy” was originally used as a form of divination based on interpreting patterns in dirt or rocks. Not quite as cool as what they do in the game, is it? But then, it would be difficult to use divination to battle monsters, although there is an Oracle class in later versions of FFV. The Japanese name for the class translates as “feng shui soldier,” as the Chinese metaphysical philosophy also involves the effects of the environment on people. The use of bells as weapons results from their usage in feng shui, at least according to the Final Fantasy Wiki entry. Mog’s dances in FFVI involve geomancy of the FF variety, as they often rely on the environment. Aerith in FFVII was originally planned to be a geomancer, but there ended up not really being a job system, even a fixed one, in that game. She does, however, draw power from the planet. 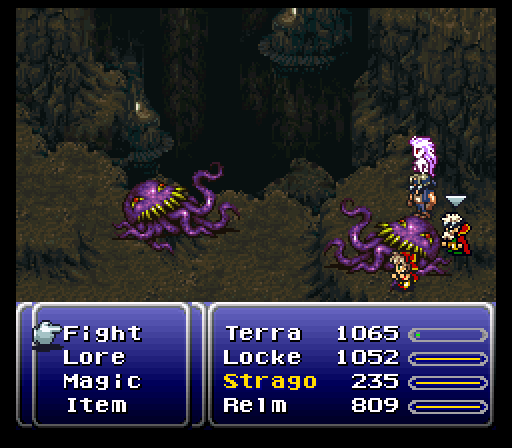 By the way, I only just found out that the official class of Relm from FFVI, who can make sketches of enemies that attack their models, is Pictomancer. I believe this job also appears in the online game FFXI, but not any others. I wonder if Jinjur and Mr. Smith from the Oz books would be considered pictomancers. This entry was posted in Final Fantasy, Magic, Video Games and tagged aerith gainsborough, cecil harvey, feng shui, final fantasy iii, final fantasy iv, final fantasy v, final fantasy vi, final fantasy viii, geomancer, geomancy, mages, mog, pictomancer, relm arrowny, rosa joanna farrell, teleportation, time compression, time mage, ultimecia. Bookmark the permalink.